The original source of this recipe was from the cookbook, “Frankie at Home in the Kitchen” by Frank Curtiss, I’ve made a few modifications. What I love about it is of course, it’s another cozy dinner, but it also uses different flavors. It’s also an easy dinner to multi-task as you are cooking. Once you’ve thrown the sauce together and as the noodles cook, make a salad, help with homework, break up a fight, yell at someone to “step away from technology,” separate a much needed Lego piece, and just enjoy your typical evening as you transition back into the kitchen and unwind. Pasta – go for any of the fun shaped noodles, not spaghetti. In a large skillet, brown the sausage, breaking it up a bit as it cooks so you have small pieces. When half your sausage is browned, add the onion and garlic. Continue cooking until the sausage is no longer pink. Stir in the pumpkin and chicken broth. Bring it up to a boil, then turn down the heat to an easy simmer as you cook the noodles. Let your sauce simmer for at least 20 minutes. 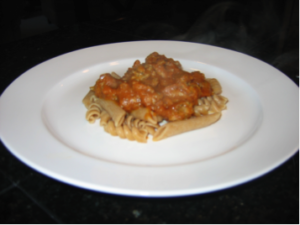 When ready to serve, you can either add the cooked, drained pasta to the sauce, or plate the noodles and spoon the sauce over. Enjoy!